Legendary blues guitarist Robert Johnson was often thought to of traded his soul to the devil for his amazing musical abilities. Taking this as fact, Me and the Devil Blues chronicles the life of RJ, a man who has sold his soul to the devil, with all the misfortune in entails, and sets out as a traveling bluesman. Unfortunately for him the first man he meets is the most famous criminal of his day: Clyde Barrow. Del Rey has released a special large edition that collects the first two volumes of the manga into one over-sized volume. Part bio, part myth, part southern gothic, and part classic americana, Me and the Devil Blues is one of the most ambitious manga to come out in America. 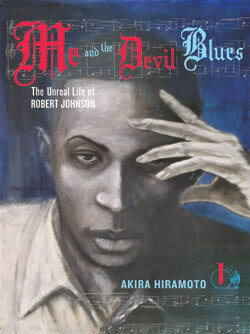 Akira Hiramoto uses the known parts of Robert Johnson’s life and fills in the rest with an almost whimsical tale of life, death, and blues in the Deep South. Just reading it it’s almost impossible to tell it wasn’t written by an American with its attention to detail. Akira Hiramoto really did his research for this. While there are many exaggerated and magical parts, that’s where the southern gothic comes in, it never purely leaves the realm of reality and always recognizes, in a somewhat subtle way, the real difficulties for a black man in the south in the 1930’s. Akira Hiramoto has an amazing art style. He doesn’t fall into the usual cliche’s of drawing African-Americans but render each one as purely human and unique individuals. His artwork even sometimes descends into the purely abstract to create some truly devilish images to show that even if this is reality not everything is as it seems. The characters so far are really the life of the story. RJ, for a guy who sold his soul to the devil, really is a sympathetic guy, characterized in equal parts by his love of blues and his own cowardice. Clyde is just as insane as you would expect a career criminal to be. He’s mad and bad, but not necessarily dangerous to know as he and RJ to strike up an unlikely friendship. RJ erstwhile companion Ike, a devil that doesn’t act like the devil, is really fascinating, undoubtedly for those same supernatural elements. Classic characters of the Mississippi Delta - jealous husbands, cheating wives, prohibitionists, racists - also show up in abundance. The story starts to lose pace somewhat as it shifts in the second volume to focus on Clyde and the heads of a racist town. While RJ is absent for a lot of this he still features heavily as the crux of the story. The compelling, manic Clyde is also interesting enough to star on his own for a bit. As good as Akira Hiramoto’s art style is when it comes to showing humor it seems to devolve into the kind of exaggerated drawings you would see in a gag manga. Not exactly bad, but out of tune with the seriousness of the rest of the story. Really one of the best, most unique works right now. Fans of mature manga cannot afford to miss Me and the Devil Blues.